“We are not human beings having a spiritual experience. We are spiritual beings having a human experience”– Pierre Teilhard de Chardin. From a limited perspective, we humans appear to be insignificant little beings in a mysterious cosmos that we cannot comprehend with our senses. This is the perspective of the human ego which has grown accustomed to viewing everything and everyone as separate. This feeling of separation is the root cause of several problems on Earth. From the perspective of spirit, we all are just one energy form, which is seemingly split into multiple fragments. We are one with the whole Universe. As spiritual beings, we are inherently powerful with the capacity to live amazing lives, love beyond measure and heal with power. But many of us feel like helpless victims being tossed around by forces beyond our control. We look for people and circumstances to blame when all we need to do is look within and connect with our true source of power. After having lived as powerless beings for so long, it can be rather difficult to reclaim our spiritual power in a jiffy. To make this task easier for us, we can call on Archangel Raziel. Archangel Raziel is often referred to as the “Wizard of the Archangel Realm”. In pictures and oracle cards, he is often depicted as a wise old man with a beard. He is an embodiment of wisdom, power and knowledge. He is the Archangel to call on when we wish to understand the secrets of the Universe and our relationship with existence. He can help us master the art of manifestation. He can help us heal the third eye chakra and to develop the ability to see beyond what the senses show. He can help us tap into our innate healing powers and to remember what we already know in the depths of our being. Light a candle and play some soothing music. Request Archangel Raziel to be your guide and to sit by your side. Visualise a beautiful rainbow over you. The light associated with Raziel as well as Reiki is rainbow coloured light. By visualising the rainbow, you will be making a connection with both. Visualise this rainbow coloured light flowing down and enveloping you from head to toe. See yourself afloat on waves of this rainbow energy and let it wash over you from every angle. Visualise the Reiki symbols of your choice dropping down from the rainbow and working on you. Do use the Master Symbol if you’ve done third degree. Just relax and allow the rainbow energy to work on you. After a while, allow yourself to expand. See yourself as an energy form moving beyond the body and becoming one with the Universe. Put your hand out and reach out to the mighty Raziel. Allow his energy to touch you. See yourself as wise and powerful, just like him. In the light of the rainbow, you are able to see your connection with all of existence and you get closer to Spirit, which is your true self. Feel all the blocks in your third eye dissolving. As the blocks dissolve, allow your healing powers to resurface. If you are a Reiki healer in this lifetime, it is quite likely that you have been a powerful healer in some of your past lives too. You are a talented healer and you know much more than you think you do. Allow your talents to resurface. Flow with the experience. Allow your intuition to lead you if you need additional healing with any issue that pops into your awareness at this point. You can visualise rainbow energy surrounding the situation and heal it from a place of power. Stay in this state for as long as you wish to and absorb all the energy being sent your way. Once done, take a few moments to relax and return to your normal state of awareness. Thank Raziel and Reiki for their help. This practice is best done before going to bed as the sleep state can help you absorb the healing faster. But it can be done at other times as well. 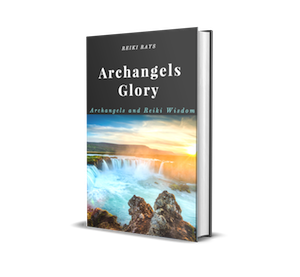 The more you work with Archangel Raziel, the more you will open up to the power of your Being. You will understand the dynamics of the Universe and find true power as you discover your oneness with existence. You will master the art of manifestation. Instead of begging and pleading with the Universe to fulfil your desires, you will emerge as a powerful co-creator and become the script writer of your destiny. You will acknowledge and appreciate your healing powers and use it for the greatest good of humanity. Thanks for the idea. Will certainly work on it when feasible Neelam. Thank you for this article Haripriya, interestingly Archangel Raziel has appeared twice in Archangel card readings last night. That’s wonderful. Thank you for sharing Naveena! Please could you share with me what this ciuld mean? Thank-you, Hairpriya! I’m currently working/learning/conversing with Angels & this is wonderful. Can’t wait to try it! Thank you for this Haripriya…I loved what you wrote “if you are a reiki healer in this life….” I have never invoked Archangel Raziel, so thanks for introducing him to me! Grateful for sharing your insight with me! I am a Reiki Channel now.PLR of mine says ” I was same too! Thank you for this article. its really Very insightful. Thank you very much for the wonderful insight Haripriya.